An optional kit for this project is available for $20. The kit includes: The pattern, all needed wool, homspun bakcing, one sheet of Soft Fuse, and a #24 Chenille needle. The only thing necessary for class that is not included is thread since so many of us have a lot of that handy. Lisa will have pearl cotton and bags of the ground walnut shells for stuffing the pincushion for sale at the class. 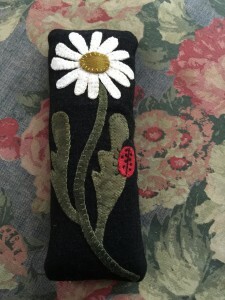 If no kit, will need to purchase the Required Pattern: Daisy Pincushion by Primitive Gatherings from Lisa for $6.00 on the day of the class. PLEASE DO NOT COPY PATTERNS. Please direct any pre-class questions to marie Girard who will get answers to your questions from Lisa. This entry was posted by Jenny. Bookmark the permalink.